The Homevol Lapdesk blends function with design and made of natural bamboo brings a transitional feel to a classic piece. Comfortably read magazines or tablets on the flip top portion for comfort with 5 adjustable angles. Place a drink or snack bowl on the remaining leveled surface and the small pull out drawer keeps your essentials nearby. Comfortably lay the desk on your lap or expand the foldable legs and rest it on a flat surface. - MULTIFUNCTIONAL BAMBOO LAPTOP DESK: 100% natural bamboo, environment friendly and sturdy. Used for surfing the Internet, eating food, - coloring, reading, doing homework on the bed, sofa, recliner, floor, car, etc. ADJUSTABLE DESIGN: 5 Slots for you to adjust 5 different height, supporting more cozy sight line. Eye-level sight's situation is good to prevent ache of back and waist. Good design bring you more healthy lifestyle. BAMBOO LAPTOP DESK: 100% Bamboo laptop table with adjustable table top brings a transitional feel to a classic piece and environment friendly. Tilting, folding, stable, very high quality and easy to store.Load capacity: 20kg. CONVENIENT LAPTOP DESK: Worry-saving Cup-Groove. Small drawer with Built-in Magnet for storing pen, note pad or phone without worry of the drawer rolling out. A stopper prevents your lap from slipping from the desktop.Foldable and extented legs for easy storage.Table height: 22.8-31cm/8.9-12.1inch.Table size: 55 x 35cm/21.5 x 13.7inch (L H W). 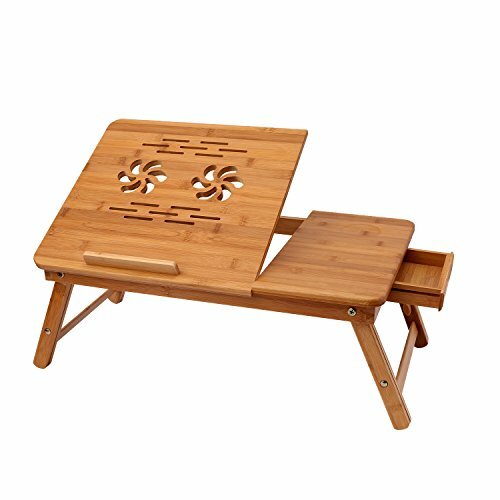 OCCASIONS: The bamboo lap desk with a tilting carved surface and adjustable legs is suitable for using as a laptop table, reading desk, breakfast tray, coloring table, working desk in bed, on the floor, sofa, recliner, car, and when travel. HEAT DISSIPATION FUNCTION: Natural bamboo has its own ability of heat dissapation. Beautiful hollowed out swirl-shaped desktop design for better radiating. If you have any questions about this product by Homevol, contact us by completing and submitting the form below. If you are looking for a specif part number, please include it with your message.